For many of us, getting a good night sleep is not easy. We spend thousands of dollars on the latest and greatest mattresses for our beds, but in so many cases we still get up in the morning tired, with aches and pain and after awhile, we start to believe this is normal. I can tell you from my many years of experience, it is not normal. I have suffered with back and spinal issues for years and purchased one of the best mattresses available at Costco some years ago, yet I got up each morning with aches and pain. A few years ago I purchased a Sleep Innovations memory foam topper from Costco for our guest room’s queen sized bed. I never slept in it, but guests always commented what a great nights sleep they had. Since our master bedroom is on our second floor addition, it tends to be hotter during the summer then the main floor. So during a recent heat wave, I decided to try sleeping in the guest room on our main floor which was cooler. Once I got into that bed, I realized there was a difference. My body seemed to sink into the luxurious memory foam and it was so much cooler then the bed upstairs. For the next week or so during the heat wave, I slept downstairs and loved it. Instead of spending over $1,000 for a new mattress I realized that all I might need is a memory foam topper. I wanted another Sleep Innovations topper like the one I had purchased at Costco, but couldn’t fine any Sleep Innovation toppers on their website. 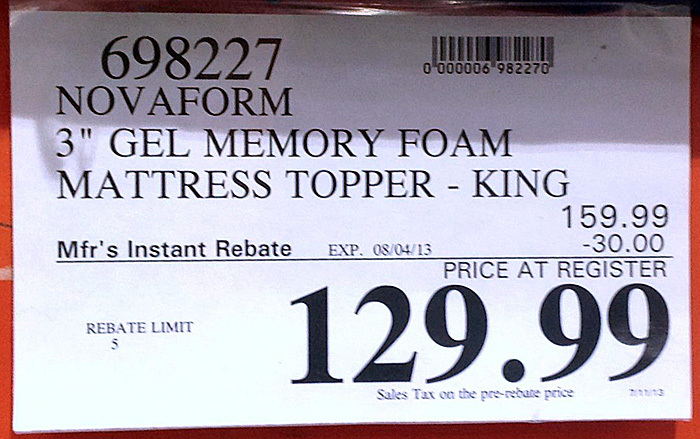 In the meantime I began to research memory foam toppers on the internet and it was confusing. 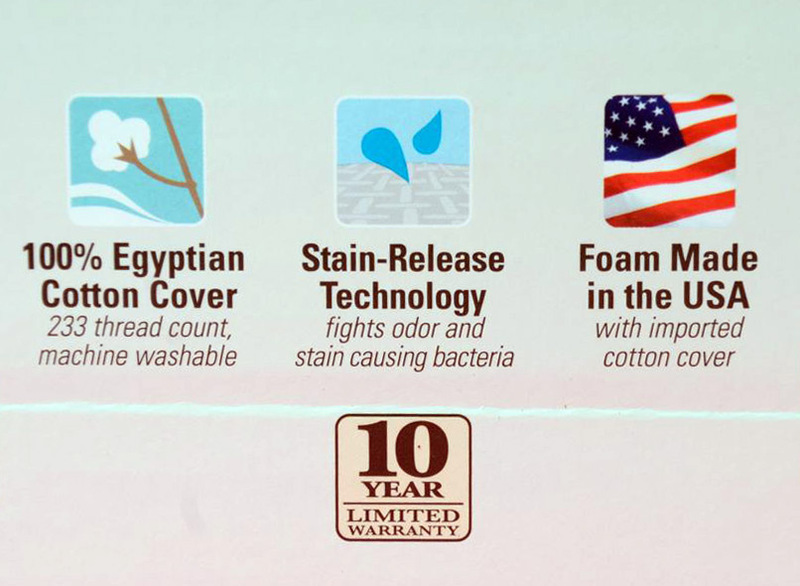 I read a number of reader reviews and discovered that many memory foam toppers had a noxious odor. Apparently it is produced by the chemicals used to make the foam, that isn’t a good thing. I also read that it could take days or weeks for the odor to disappear. Other reviews talked about the foam that didn’t have a memory, in other words it would flatten out in time. Some said the foam was hot in the summer, not something I wanted for my bed. As I continued my research I read about the foam quality, how it was made, some with fillers and premium toppers made of 100% memory foam. There were discussions about the foam density, some claimed the higher the density the better the foam. After hours of research I discovered that a 3″ topper is perfect for the average adult. So after reading all the information about memory foam, quality, density and even specific brands I decided to purchase another Sleep Innovations topper at Costco, but couldn’t locate them by name. I contacted Sleep Innovations and told them I know they sell Costco, but couldn’t find their products online or in the store. I was told that Costco sells their products under their Novaform label, something many manufacturers do when they sell to Costco. So back to my Costco store to see if the Fall line of mattresses and toppers had arrived. They were now on the floor and arrived in the middle of July. Because of my experience with their product and my absolute joy in sleeping on one of their older toppers, I decided that I should purchase one and then share my findings with my readers. I could write an updated review about the new and improved topper I was about to purchase and do a little video showing how to install one of these on a bed. Now many of my readers know I am the author of the most popular article about saving money at Costco on the internet. With over 700,000 reads my article “Secret Price Codes Can Save You Money At Costco” has become the holy grail for hundreds of thousands of Costco shoppers. So being a Costco expert of sorts I simply had to let my readers know about this product and the great price it was selling for at Costco. I was lucky to catch a manufacturers instant rebate on the topper and saved a cool $30. Imagine being able to renew and improve my king sized bed for $130 smackers, I was a happy man. As I previously mentioned, Novaform is the brand name being used for all of the Sleep Innovation products sold in the Costco stores. It is not uncommon for companies to create a different label for some of their larger customers. I would assume it is a good way to monitor sales and returns as well. I found that Costco carries a broad range of products from Sleep Innovations. I saw their mattresses, toppers, pillows and even memory foam mats ( I bought one of these too). As the summer seasonal merchandise is marked down in July and removed from Costco’s floor, it is then replaced with furniture and bedding. At this writing their is a promotion from Sleep Innovations at Costco, so this is the perfect time to get there and purchase their mattresses, toppers and pillows. Don’t forget to purchase one of their memory foam bath and kitchen floor mats too. 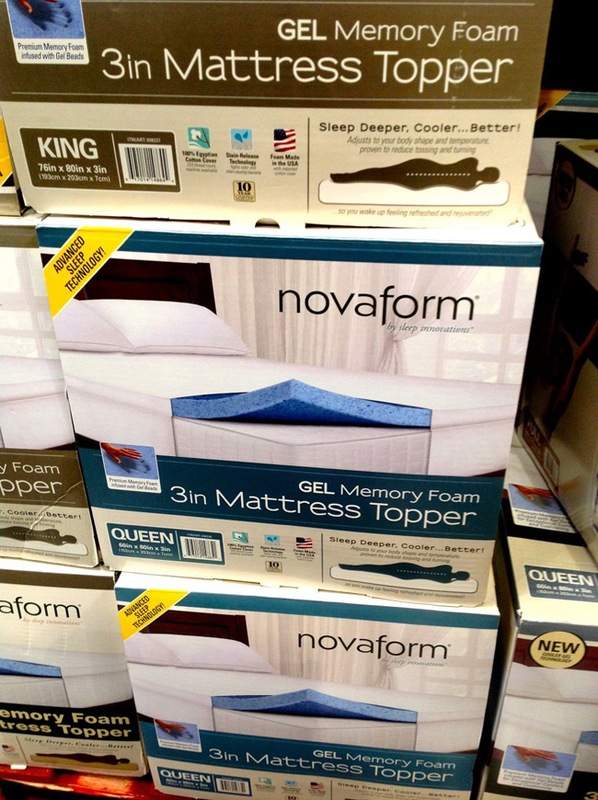 For a limited time (until August 4, 2013) the 3″ Novaform topper that is sold at Costco for $129.99 after the $30 manufacturer’s instant rebate promotion. If you can’t get their in time for the rebate, not to worry, at $159.99 it is far less expensive then others and a lot less expensive then replacing your current mattress. Other sizes are available and also have similar rebates, so check your local Costco for the current prices. Now if you miss this promotion, I am almost certain there will be another one later in the season. Remember, Costco has a 30 day price protection policy and if you read my article you will discover this protection can be extended. I wanted to review their 3″ topper and wasn’t sure if I should publish this as an article or a review. Because I wasn’t sure, let this review serve as both. The King size 3″ topper weighs in at a bit over 30 pounds, so it is dense, which is a good thing. 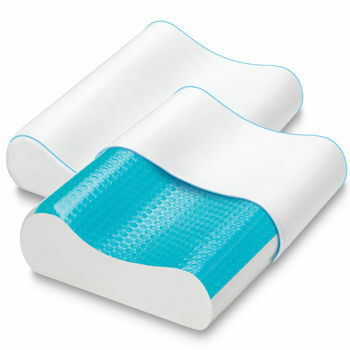 Their memory foam contains a gel that helps the memory foam stay cool and breath properly, two benefits some of the other memory foam toppers seem to lack. I found this one recovers quickly and offered me the support I needed. Having a bad back and a couple of spinal surgeries behind me, I learned that sleeping on my back was near impossible, even though my doctors recommended I should. He told me to put a pillow under my knees and roll up a towel and place it under my neck, this way there would be no strain on my vertebrae. I tried this after my last cervical spine surgery and I just couldn’t get to sleep. With my new Novaform topper, I could sleep on my back and it was oh-so-comfortable. No pillows or towels necessary either. The foam seemed to mold to my body and offered me the support my mattress never gave me. The first night I had used the topper, I awoke feeling rested, for the first time in years. I turned to my wife and asked how she liked it and we both agreed it was wonderful. Now installation was easy. 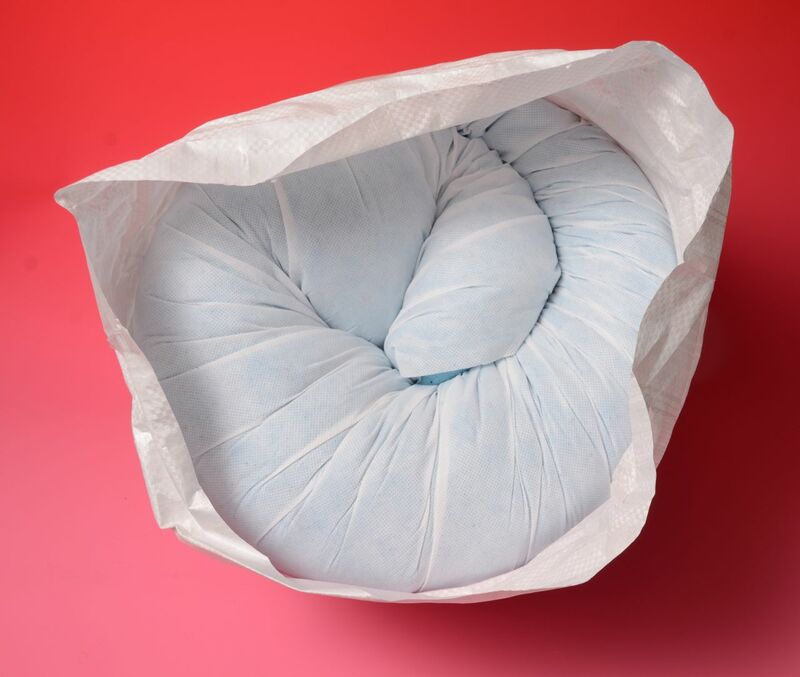 The topper comes folded and rolled up with a protective sheet around it in a compact box. I would never have guessed they could get this 3″ 76″X80″ topper in this carton, but they did. I shot this video showing you how I installed it. As you will see I removed the outer sleeve and spread the topper over the top of my mattress. As I unfolded it and unrolled it, I could see it expand before my eyes and within a few minutes it was fully expanded. I made sure I had if set up on the bed properly and the 80″ side was of course running from the top to the bottom of the bed. I went to smell the topper after reading so many reports of odors and found there was no noticeable odor coming from the topper at all. So the reviews I read about other brands of toppers having this foul odor was certainly not the case with the Sleep Innovations topper. It may be because of their process and the quality of their materials used in their manufacturing process. Now it was time to put on the included 100% Egyptian cotton cover (the only item imported). This was designed to go over the topper and slip nicely under the mattress, which it did. This was made to fit perfectly and can accommodate even the thicker mattresses with the pillow tops, which mine had. I then took our quilted mattress cover and put that over the mattress and topper and that also fit perfectly. Finally we put our fitted sheet on the bed, it never fit well on our original mattress, but the 3″ addition from the topper made it fit the way it should have, nice and snug. SI uses a premium memory foam that is infused with gel beads. This process allows 12 times more airflow then other toppers and that is a major benefit in the summer and winter. It not only maintains the right temperature for extra comfort, but superior support and cushioning. Now the gel beads help to deliver personalized support, conforming to your body’s contours. 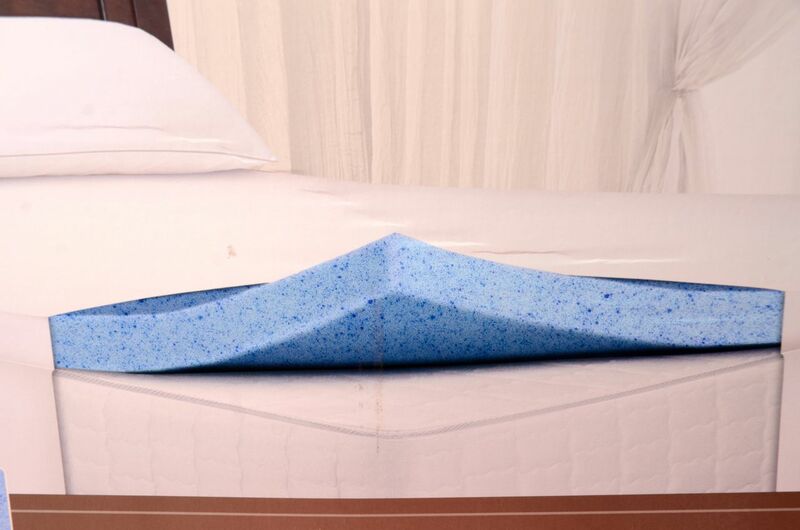 No need for pillows under your knees, this topper really does mold to your body, no traditional mattress can do this. Now for me one of the best parts in purchasing a topper from Sleep Innovations is that they are all American Made and come with a 10 year limited warranty from the manufacturer. The companies headquarters is in New Jersey and has factories all over the U.S. produces this fine product and at prices that are not only competitive to those cheaper imports but has the Costco Seal of Approval. That means, if for any reason you are not satisfied with your purchase you can return the product for a full refund. Want to find out more about this product? View their video on YouTube. We love Costco and we now love Novaform by Sleep Innovations. I have been testing some of their memory foam pillows as well and think I found the perfect one for my needs. It is the Cool Gel Contour Pillow now on sale at Costco at only $18.99 after the manufacturers $6 instant rebate. You can grab these online now at the Costco website, they sell it as a two pack for only $47.99 (after the $12 instant rebate) which includes S&H. This offer ends on August 4th so hurry. Note: You must be a Costco member to purchase these products online or in their stores. Visit the Sleep Innovations website to learn more about this company and their full line of products.